Wo. That was very interesting. What do you think about the site? Thanks for sharing it. So, what do people do, post comments and then the site editor puts graphics to it? Girl, I went to this site ... WONDERFUL! I'm going to send a post card too. oh I found it a few weeks ago and there are some amazing post cards on here, thought-provoking! it is a very interesting site. how honest are we - even to ourselves. really? it's not easy. 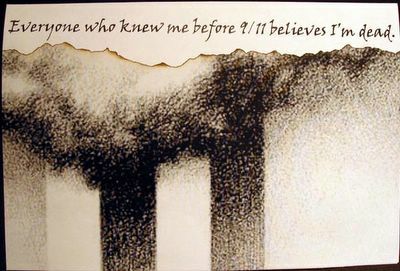 I had seen this posted on various other blogs, but wasn't really moved to check any of the other postcards out until I saw that one about 9/11. Whoa. Can you imagine? I bet there are more than a few people out there that took the opportunity to just pick up and start new lives elsewhere--regardless of the families they were leaving behind. I adore your blog, girl! Miss you in Ebz! @proactiff... i think there's a link that tells you the instructions on HOW to submit your own "secret". @systa soul... yeah... i think i have a secret i need to tell SOMEONE. @pearlie... i'm so glad you came by. isn't that amazing? just starting ALL over again. I see the other comments about how "interesting" the site is. Am I the only one who was totally moved by it? Maybe I should have kept that a secret. @chele... i was TOTALLY moved by it as well.